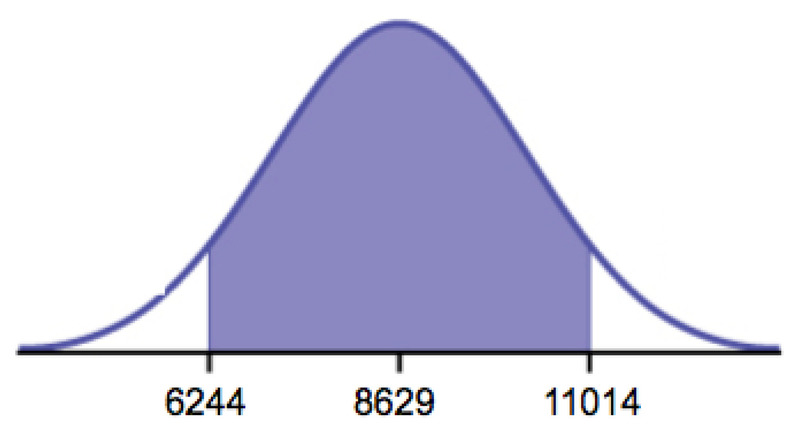 Up until the mid-1970s, some statisticians used the normal distribution approximation for large sample sizes and only used the Student’s t-distribution only for sample sizes of at most 30. With graphing calculators and computers, the practice now is to use the Student’s t-distribution whenever s is used as an estimate for σ. If you draw a simple random sample of size n from a population that has an approximately a normal distribution with mean μ and unknown population standard deviation σ and calculate the t-score t = , then the t-scores follow a Student’s t-distribution with n – 1 degrees of freedom. The t-score has the same interpretation as the z-score. It measures how far is from its mean μ. For each sample size n, there is a different Student’s t-distribution. The degrees of freedom, n – 1, come from the calculation of the sample standard deviation s. In [link], we used n deviations to calculate s. Because the sum of the deviations is zero, we can find the last deviation once we know the other n – 1 deviations. The other n – 1 deviations can change or vary freely. We call the number n – 1 the degrees of freedom (df). A Student’s t table (See [link]) gives t-scores given the degrees of freedom and the right-tailed probability. The table is very limited. Calculators and computers can easily calculate any Student’s t-probabilities. using invT(.975,14) on the TI-84+ calculator. When calculating the error bound, a probability table for the Student’s t-distribution can also be used to find the value of t. The table gives t-scores that correspond to the confidence level (column) and degrees of freedom (row); the t-score is found where the row and column intersect in the table. The Human Toxome Project (HTP) is working to understand the scope of industrial pollution in the human body. Industrial chemicals may enter the body through pollution or as ingredients in consumer products. In October 2008, the scientists at HTP tested cord blood samples for 20 newborn infants in the United States. The cord blood of the “In utero/newborn” group was tested for 430 industrial compounds, pollutants, and other chemicals, including chemicals linked to brain and nervous system toxicity, immune system toxicity, and reproductive toxicity, and fertility problems. There are health concerns about the effects of some chemicals on the brain and nervous system. [link] shows how many of the targeted chemicals were found in each infant’s cord blood. Solution AFrom the sample, you can calculate = 127.45 and s = 25.965. There are 20 infants in the sample, so n = 20, and df = 20 – 1 = 19. The 98% confidence interval is (2.3965, 9.8702). The t-score follows the Student’s t-distribution with n – 1 degrees of freedom. The confidence interval under this distribution is calculated with EBM = where is the t-score with area to the right equal to , s is the sample standard deviation, and n is the sample size. Use a table, calculator, or computer to find for a given α.
X is the number of hours a patient waits in the emergency room before being called back to be examined. is the mean wait time of 70 patients in the emergency room. is the mean number of hours spent watching television per month from a sample of 108 Americans. Using the same , , and level of confidence, suppose that n were 69 instead of 39. Would the error bound become larger or smaller? How do you know? Using the same , , and n = 39, how would the error bound change if the confidence level were reduced to 90%? Why? Define the random variables and in words. We estimate with 96% confidence that the mean amount of money raised by all Leadership PACs during the 2011–2012 election cycle lies between 47,292.57 and 456,415.89. The 96% confidence interval is (47,262, 456,447). Forbes magazine published data on the best small firms in 2012. These were firms that had been publicly traded for at least a year, have a stock price of at least 5 per share, and have reported annual revenue between 5 million and 1 billion. The [link] shows the ages of the corporate CEOs for a random sample of these firms. Use this sample data to construct a 90% confidence interval for the mean age of CEO’s for these top small firms. Use the Student’s t-distribution. X is the number of unoccupied seats on a single flight. is the mean number of unoccupied seats from a sample of 225 flights. In a recent sample of 84 used car sales costs, the sample mean was 6,425 with a standard deviation of 3,156. Assume the underlying distribution is approximately normal. A survey of the mean number of cents off that coupons give was conducted by randomly surveying one coupon per page from the coupon sections of a recent San Jose Mercury News. The following data were collected: 20¢; 75¢; 50¢; 65¢; 30¢; 55¢; 40¢; 40¢; 30¢; 55¢; 1.50; 40¢; 65¢; 40¢. Assume the underlying distribution is approximately normal. a continuous random variable (RV) with pdf , where μ is the mean of the distribution and σ is the standard deviation, notation: X ~ N(μ,σ). If μ = 0 and σ = 1, the RV is called the standard normal distribution. There is a “family of t–distributions: each representative of the family is completely defined by the number of degrees of freedom, which is one less than the number of data. A Single Population Mean using the Student t Distribution by OpenStaxCollege is licensed under a Creative Commons Attribution 4.0 International License, except where otherwise noted.